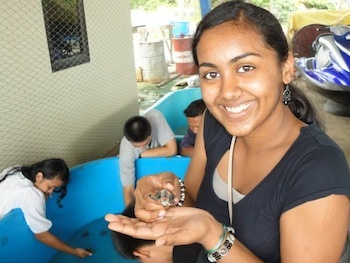 Sindhu Chidambaram is a high school senior in the Global Ecology Magnet Program at Poolesville High School in Poolesville, MD. Last summer she traveled to Indonesia as a participant in Legacy’s Indonesia-US Youth Leadership Exchange program where she visited several environmental projects, like saving sea turtles and tree reforestation projects, and eroded beach restoration. As a result of her training in the program and during the Global Youth Village environmental workshops, she was able to develop the Oyster Reef Ball Project which directly impacted 165 people, and reached more than 4,000 indirectly. “I am so grateful to have been given such an incredible, life-changing opportunity like I-US-YLP and I am so blessed to have met such inspiring people in 2013…! The lessons I learned and these amazing memories will stay with me forever!” – Mrs. Sunila Varghese-Saunders from Robert Frost Middle School. Sindhu chose to address a water quality issue in her own community as her follow-on project and to raise awareness of this issue with future generations. 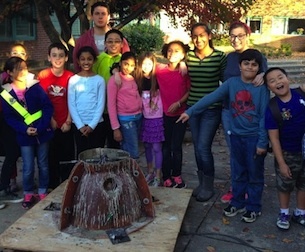 She developed a hands-on learning experience for elementary students, educating them about the plight of the native oysters in the Chesapeake Bay, and then lead them in building the reef balls. Reef balls provide badly needed habitat and breeding areas for native oysters which are vital to the health and water quality of the Bay. 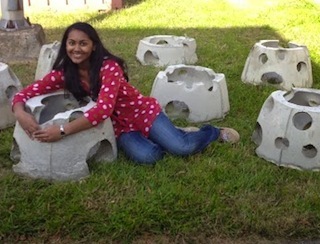 Sindhu presented her program to 6 different schools resulting in 7 reef balls, 6 of which will be placed in the Bay by the Chesapeake Bay Foundation, and the 7th kept on shore for educational purposes. Although her initial project efforts were impressive and significant, Sindhu didn’t stop there. The positive impact she saw in the students she worked with motivated her to secure a meeting with the County Executive, the Montgomery County Office of Environmental Protection, and Curriculum Development staff at Montgomery County Public Schools. She presented the success and benefits of the Reef Ball Project to these agencies and proposed the development of this interactive project added to the 4th and/or 6th grade ecology curriculum. The proposal was well received and Sindhu will continue to be part of the expansion of her project as it continues to develop.